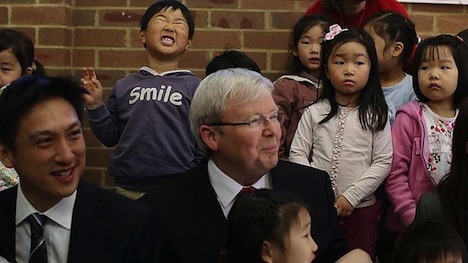 Another day on the campaign trail for Labor prime minister Kevin Rudd, though yesterday’s star was Joseph Kim, a five-year-old who delighted in making faces as the cameras rolled away at a Rudd campaign stop at a Korean church in Sydney on Wednesday. Australians vote in exactly one month on September 7 to determine whether to give Rudd a full term as prime minister, six weeks after his fellow Labor colleagues reinstated him as party leader when polls showed that former prime minister Julia Gillard had virtually no chance of winning this autumn’s election. Gillard had replaced Rudd as prime minister in June 2010 after griping over Rudd’s management style. All together, Labor is seeking a third consecutive term — Rudd led the party to a robust victory in November 2007, and Gillard led the party to the narrowest of victories in August 2010. 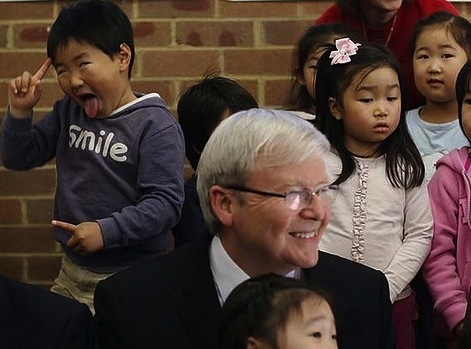 Rudd faces Tony Abbott, the leader of the National/Liberal Coalition, which governed the country under former prime minister John Howard in the early 2000s.